Empire is a major theme in the Bible. From Pharaoh in Egypt and the Exile, to King Solomon of Israel and the monarchy, to the Babylonian empire, to the Roman empire, finally with a showdown in Revelation; the concept of empire comes up time and time again. The Bible never has anything good to say about empire. But what is Empire? Is empire an issue we have to deal with today? 1. Military. An empire not only has a military, it often commands the best military in the world. Better soldiers, better weapons, better funding, better strategy. An empire has trust in its military for its safety and security. 2. Economic. An empire is an engine that drives the world’s economy forward. Its people trust in its markets for their peace and prosperity. 3. Political. An empire has a way of organizing the power structures that run society. Its emperor, or president, or prime minister, plays more than a leadership role or celebrity role… they play the role of a pseudo-god. An empire places trust in its particular form of government, believing it to be superior above all others. 4. Ideology. An empire uses a shared narrative about “the good life,” in order to control and conform. It has to get you to do its bidding through law and through culture. The empire needs you to fit into the image it creates; to behave and think like it wants you to. Empires are rich and powerful nations which believe they have a right to rule people (and other nations). They proclaim a “manifest destiny” to shape the world according to their agenda and values. God regards this as a transgression upon his sovereignty. What empires claim for themselves, God promises to his Son (Matthew 28:18). Scripture states that Jesus alone has the right to rule over the nations (Isaiah 9:5-6). The throne of God and political empire will always be in opposition to one another (Isaiah 14:22-23). God and Satan will always be in opposition to one another. Empire is the primary method Satan uses to oppose the will of God. The enemy is not omnipresent; he cannot be in all places at once, tempting every person on the planet. In order to accomplish this, Satan uses systems and power structures, built up over hundreds or thousands of years. He must work with our fallen desire to exert coercive power over other people. How does he do this? He does this through power structures embedded in the very nature of national governments, especially those of empires. How can he do this? He can do this because he controls all the kingdoms of the world. Satan rules by commanding the nations. The devil just said that he has authority over all the nations in the world. It’s interesting that Jesus doesn’t dispute the devil’s incredible claim of ownership! Christ’s response? “It is written: ‘Worship the Lord your God and serve him only.’” That’s it. Jesus also doesn’t dispute that the devil could make good on his offer. In fact everything else that the New Testament says about the devil supports his claim. On several occasions Jesus refers to Satan as the “prince” or “ruler” of the world (John 12:31; 14:30; 16:11). Paul says he’s “the god of this age” and “the ruler of the kingdom of the air” (2 Corinthians 4:4; Ephesians 2:2). John claims, “The whole world is under the control of the evil one” (1 John 5:19). Finally, in the last book of the Bible, all governments are depicted as the beast and Babylon. Babylon symbolizes the systems of government that deceive the world and oppresses all people, but that are now falling under the judgment of God (Revelation 13; 14:8; 17:5; 18). The satanic project of empire is always destined to fall. Prophets ahead of their time, from the time of Israel to the present day, will shout “Babylon is fallen!” (Revelation 18:2) Empires live by the sword and they eventually all die by the sword. Since the time of Cain slaying his brother, mankind has been seduced into exercising dominion over other people. This seduction can be satiated by participating in the ways of Empire. The State is rooted in violence. Governments are inherently defined by their ability to use violence against others. Individuals are not allowed to steal and kill, but when they work for the State, it’s called taxation and “fighting for your country.” Violence is viewed as a legitimate way of shaping the world. These systems of belief run deep, and practically become their own religion. This is all in outright betrayal of Jesus Christ and his revolutionary way of life. Today we don’t use the word Empire, we use the term Superpower. For first century Christ followers, the Superpower was Rome; a powerful nation that dominated the land with fear, torture, and coercive violence. Rome spread its military bases around the known world. 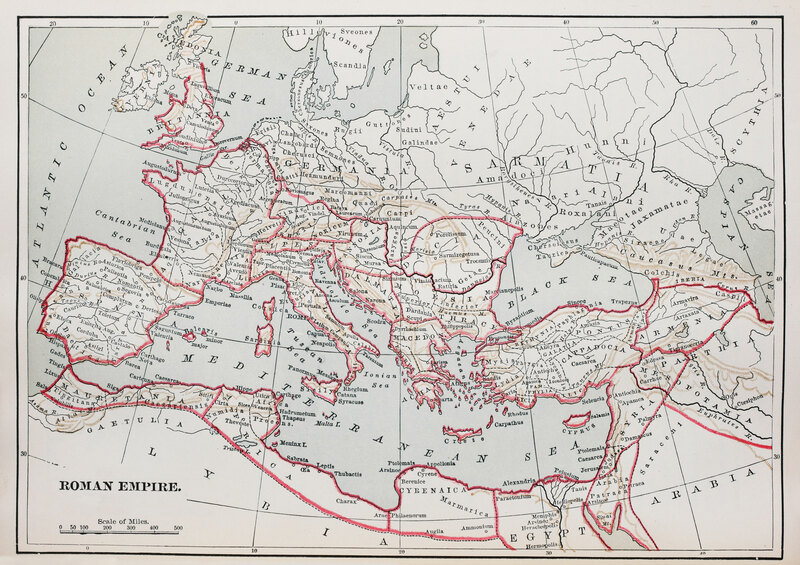 Rome claimed that its empire was divinely authorized. The spirit of the Empire is still alive today. This spirit is present in the hunger for more than we need and the overlooked consequences of it being acquired. It is present in the ruling over others through military capability and geographic expansion. It is present in the reckless abuse of the Earth in order to acquire resources. In an empire, peace means tolerating one another. For empires, justice means that people who do bad things get what they deserve. Freedom means the ability to do whatever you want. The empire rules by killing some and spreading fear amongst others. Throughout history, the spirit of Empire has taken many forms. Every single empire throughout history was built on violence and was destroyed by violence. Russia, China, and America will be no different (Matthew 26:52). This is because Empire is a deeply flawed and Satan-influenced system of human society. When Jesus came to Earth, he inaugurated a new nation called the Kingdom of God. Jesus did this by becoming the slain Lamb. The Jews expected the messiah to overthrow Rome with a violent uprising. Jesus rejected that path when he was tempted in the wilderness, when riding a donkey into Jerusalem, when he disarmed Peter at Gethsemane, and when he told Pilate that his servants would not fight for him. God’s Kingdom defines peace as sacrificially loving one another. Freedom means to be free from the things we naturally want the most. Jesus showed us on the cross what true power looks like. The Kingdom always looks like Jesus – loving, serving, and sacrificing himself for all people, including his enemies. Christ’s nation shames the way of Empire. So how much trust should citizens of the Kingdom of God have in demonically-oppressed governments? The answer is; as much as Jesus did – which, obviously, was none. The Christian proclamation that Jesus is King is inherently a political protest, and so we protest empire in the way that Jesus did… with love and truth. We protest the nations of the world because we have our own nation with the one and only rightful ruler. Read more about it here.